What happens when two defendants point the finger at each other? In this interesting case of a hospital acquired infection, the focus centered on how the patient got the infection. A California man underwent a knee arthroscopy at a surgery center. Three days later he called his physician due to pain and fever. He went to the emergency room and then was admitted for more surgery including a total knee replacement and antibiotic therapy for a bacterial infection with pseudomonas aeruginosa. He claimed the surgery center and the corporation which provided sponges used to clean surgical instruments were negligent, leading to the use of an improperly sterilized arthroscope. He argued that three other patients at the surgery center during the same time contracted the same infection. He asserted the surgery center had inadequate procedures in place for sterilization of instruments and had failed to train and supervise the personnel performing instrument sterilization. The surgery center brought in an infectious disease epidemiology team to investigate the source of the bacteria. They stopped performing arthroscopic surgery and sent all surgical instruments, products used to clean the instruments and surface cultures to a lab. The manufacturers of all the sterilization equipment were also called in and inspected their equipment. All were normal. The surgery center argued that the sponges were contaminated based on cultures of the sponges. The surgery center removed the sponges and replaced the surgical arthroscopes, which ended the infections. The surgery center maintained it had not changed its sterilization policies and procedures. The surgery center also pointed to a published peer-reviewed article which had examined an outbreak of pseudomonas at a Texas hospital and had concluded the biofilm which formed around the bacteria had prevented the bacteria’s elimination with proper sterilization procedures. The surgery center claimed the sponges became contaminated when bacteria entered the packaging and used up all of the preservative. When the company doubled the amount of preservative used in its sponges no further incidents occurred. The manufacturer of the sponges paid an undisclosed amount to settle the case. The jury awarded $543,034 against the surgery center. An appeal was expected in this April 2014 case. Charles Blevins v. Coastal Surgical institute, The Ruhof Corp et al, San Luis Obispo Country, CA, Superior Court Case No. CV10062. 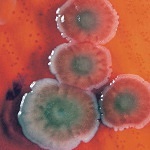 Pseudomonas is a factor in serious blood and wound infections. It can lead to pneumonia, eye, ear, wound, urinary and gastrointestinal tract, heart valve, blood, and brain infections. It is the most common pathogen that grows in cultures of patients who have been in the hospital for longer than a week. It proliferates in water and moist environments like ventilator tubing and even distilled water. It can enter through any break in the skin and attacks people with burns, cancer, AIDs and weak immune systems. Some strains of pseudomonas are resistant to nearly every antibiotic. Of the more than 51,000 healthcare associated pseudomonas infections, 13% are multidrug resistant, causing about 400 people a year to die. Pseudomonas lives in sinks, showers, mops, food, respiratory equipment, disinfectants, and toilets. It is transmitted by the hands of hospital personal, by the patient coming in contact with contaminated areas, and by eating or drinking contaminated food and water. Measures to control the spread of pseudomonas include proper isolation procedures, careful cleaning of ventilators, catheters, and other medical equipment, and using sterile technique. In this carefully defended case, the surgical center went to great lengths to find the source of the infection. I can only imagine the cost to the facility associated with the other infections (if litigation occurred) and the need to stop arthroscopic surgery until they could isolate the problem. This was the responsible and costly thing to do. Read more about hospital acquired infections in part 1, part 2 and part 3 of this series. Med League provides infectious disease expert witnesses. Contact us for help with your next case.